The location was at a favorite pond in Fairfax County, Virginia. The "Take It!" came as a part of a new program I am going to engage in when ever possible. It is to take some time on one of my days when I am not busy with visiting scheduled stops for business purposes, and get out to visit some of those locations that are favorites or hold some fascination. The intent will be to take my time and be fully open to seeing what might present itself. I hope to find subjects that will stand on their own, be juxtaposable, as well as possibly layered with something that might be out of the ordinary. This photo was a natural for it offered the chance to play with an image as well as a label. There happened to be a sort of shaft of sky light that made its way through some rather tall trees on the opposite side of the pond which gave a reflection on the surface of the water that extended far enough across the water toward the side I was standing on for me to look for subjects that could be high lit in this narrow lighter reflection. The composite seemed right, and my take away, was one that included a small bit of ponder about our language. Here was a plant that had been named after a body part of a cat. The plant is not considered to be exotic from everything I have heard but has a part of its title being interchangeable in pronunciation with a word of a different spelling and completely different meaning. No wonder it is often said, English is one of the hardest languages for a person to learn that has a different native tongue. 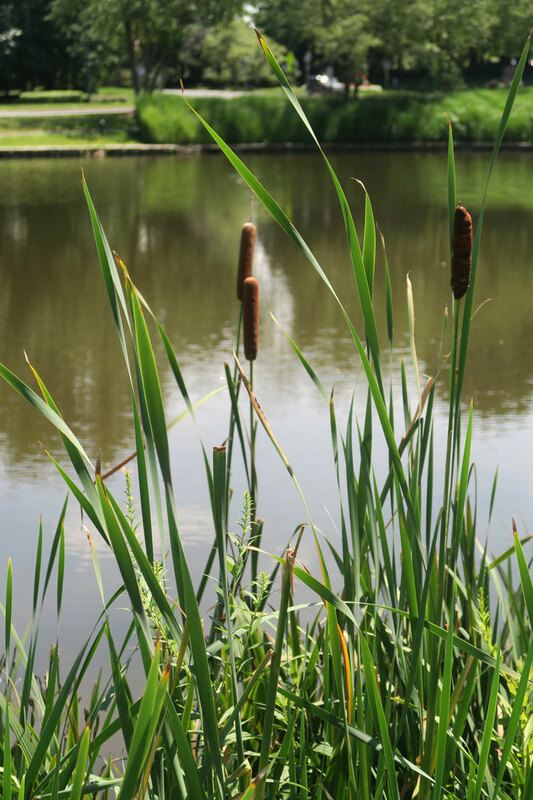 All that said The After Take: Could be a contradiction to the title for the photo, in that, these cat tails, have a short story as having been a part of most enjoyable walk, with stops along the way, on a very special Sunday afternoon. Thank you for joining me on this photo op stop. More are on their way from this stroll. The town my husband and I grew up in had a pond that was loaded with these things. Ahh cate tails.... Brings back memories of playing in the pond as a kid. The backdrop to this photo really makes the foreground pop out at the viewer, great shot! Such a beautiful photo! I am glad you took the opportunity to snap this one off, it's gorgeous!!! Looks like a great place to take a dip! Sally and Jim - you were very lucky to have grown up where such a pond was available - a great memory generator for life. Sf1967 - Thanks for the complement. The search for the vantage point for the background was a big part of the fun of taking this shot. Yuppie: Hope you googled this and got a satisfactory answer. Better yet - have a place close by where you can view them in person. Treehugger - Thanks, I am very fond of the photo as well. It is amazing to me how strong a role the long leaves play in the composition. Gabe. I have never seen anyone swimming or in the pond. There is an algie that while looking cool, I do not think would be healthy to swim in.